The Art Institute of Chicago, located in the heart of downtown Chicago, is one of the United States greatest art museums. Founded in 1879, the Institute is part museum and part school, training some of the most noted artists of the 20th century. The museum's collection spans 5000 years and virtually all continents. 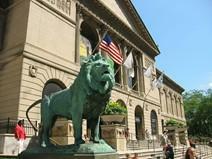 The Art Institute is particularly well-known for its large Impressionist and Post-Impressionist collections. The Art Institute of Chicago was created in 1879, rising from the ashes of the great fire of 1871. The museum quickly outgrew its quarters and moved to its present location on South Michigan Avenue in 1893. The Art Institute has been fortunate to have had many generous benefactors over the years. These include the gift of 52 Impressionist paintings from Mrs. Bertha Honore Palmer in 1924, and the masterpiece "Sunday Afternoon on la Grand Jatte" by Seurat -- which was given to the museum as part of the Helen Birch Bartlett collection. Today, the Chicago Art Institute's collection includes paintings, photography, sculpture, drawings, decorative arts, and architectural art, spanning 5000 years and touching every continent. In 2006, the Art Institute announced a 350,000,000 expansion project, to be designed by award-winning architect, Renzo Piano, and to be completed in 2009. The Art Institute of Chicago is noted for its large Impressionist and Post-Impressionist collections, which includes 30 paintings by Monet. In addition, the museum houses many easily-recognizable paintings. Chief among these is Seurat's "Sunday Afternoon on La Grande Jatte." Other important paintings include "Nighthawks" by Edward Hopper and "American Gothic" by Art Institute graduate Grant Wood. The museum also houses salvaged Chicago architectural elements, such as the reassembled Chicago Stock Exchange floor, designed by Louis Sullivan in 1894. The Art Institute's school is an accredited school of visual and related arts. The school occupies five buildings in the vicinity of the museum as well as several other sites in the Greater Chicago area. Notable students of the Art Institute include Thomas Hart Benton, Walt Disney, Edward Gorey, the fashion designer Halston, Georgia O'Keefe, Claes Oldenburg, and Grant Wood. The Art Institute is open every day of the year except for Thanksgiving Day, Christmas, and New Year's Day. The museum is open Monday through Wednesday from 10:30am to 5pm, Thursday from 10:30am to 8pm, Friday from 10:30am to 5pm, and on Saturday and Sunday from 10am to 5pm. Admission is $12 for adults and $7 for children, students, and seniors aged 65 and over. Children under 12 and museum members are admitted free. Admission is free for all on Thursdays from 5pm to 8pm. Facilities at the museum include two restaurants: the self-service Café and the full-service Garden Restaurant, which offers daily specials and wine; a coat check; and an extensive museum shop. A number of Chicago's busses and elevated trains spot directly in front of the museum's entrance. Although the Art Institute does not have its own parking lot, those driving can usually find parking in one of the many parking lots within a two-block radius of the museum.